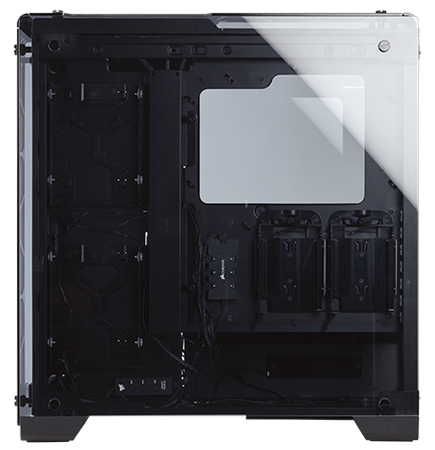 For a good number of years, Corsair's chassis portfolio has been split into four distinct categories. The Obsidian Series offers high-end appeal, the Graphite Series touts eye-catching curves, the Vengeance Series is aimed squarely at gamers, while the Carbide Series offers a lot of what's good about a Corsair case at a lower price point. Straight forward enough, yet you could argue that recent additions to each line have struggled to deliver the wow factor of some of the firm's earlier efforts. With so many manufacturers vying for attention with new-look enclosures, Corsair needs to present something that will have enthusiasts champing at the bit and it hopes the new Crystal Series will do exactly that. 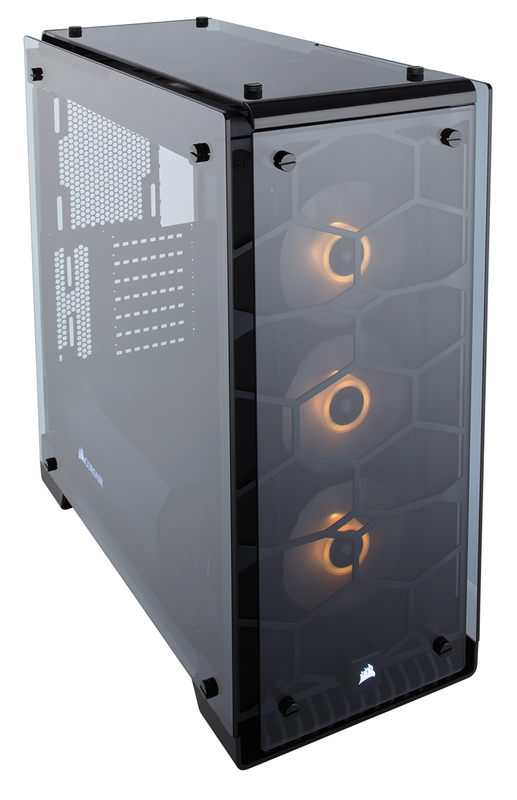 Launched today with the introduction of the 570X (pictured, $179) and 460X ($139), the Crystal Series champions popular trends such as tempered glass panelling and RGB illumination. 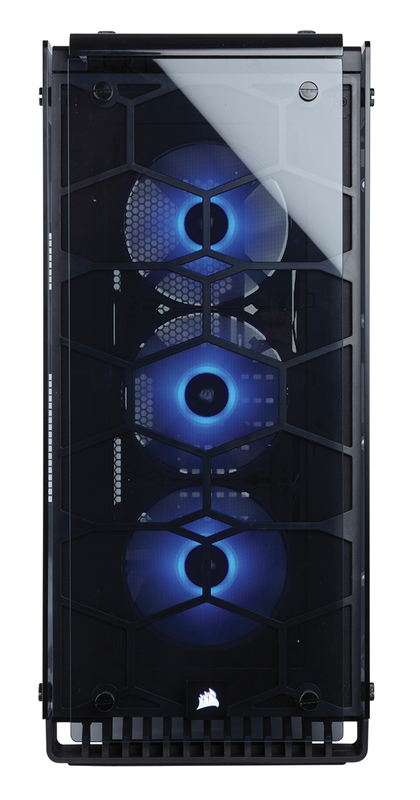 Such features have become sought after in the self-build space, and Corsair is so confident in its implementation that it describes the Crystal Series 570X as "possibly the most beautiful case Corsair has ever made." Bold claims, yet we can see how one might reach that conclusion as it is a terrific-looking bit of kit, with large tempered glass panels lining the front, sides and top. 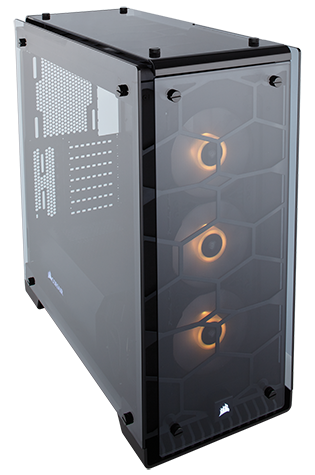 Dimensions of 480mm x 234mm x 512mm make it a mid-tower proposition, yet the transparent elements allow the case to appear smaller than it actually is - it's certainly less imposing than a traditional, all-black box. But is the 570X a classic case of form over function? Well, it's a sort-of middle ground. There are obvious limitations of such a lavish exterior - the gaps between the glass panels mean less protection for your gear, there's no sound dampening, dust could be an issue and cable clutter will always be visible - though such concerns are likely to be overlooked by anyone who falls in love with the design. It's in the aesthetics department that the 570X scores big. 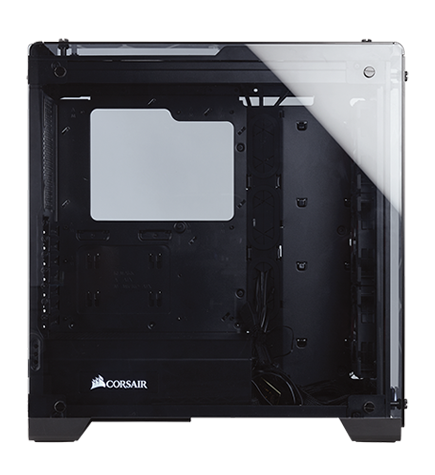 Corsair's build quality appears robust throughout, with the tinted glass panels offering good thickness and a sense of sophistication that Perspex simply can't match. Each panel is attached via four rubber-tipped thumb screws that help give the glass a floating effect, and the only potential snag in terms of looks is the design of the removable mesh filters resting behind the top and front panels. The hexagonal pattern will likely divide end users, and we're of the opinion it unnecessarily detracts from the cleanliness and simplicity of the glass. 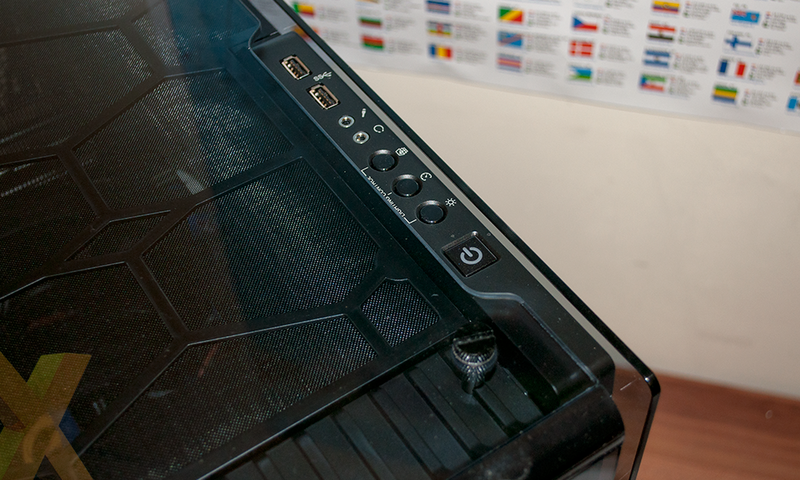 Making the most of the exterior transparency, Corsair includes a SP120 RGB Fan Kit as standard. Fetching just over £50 at retail, the kit includes a trio of 120mm RGB fans, a six-port hub and a three-button controller. The three fans are by default installed as front intakes, while the three-button controller is fixed to the rear of the motherboard tray and routed to the chassis' top I/O panel for on-the-fly adjustments to colour or effect, but not fan speed. Note that the hub supports up to six fans, meaning three more can be integrated into any chosen effect. In an effort not to spoil the seamless front profile, the I/O ports are located along the top-right edge and include a backlit power button, three lighting controls (colour, transition speed and mode), as well as audio jacks and a pair of USB 3.0 ports. USB Type-C, sadly, hasn't made the cut, and for some reason there's no reset button, either. 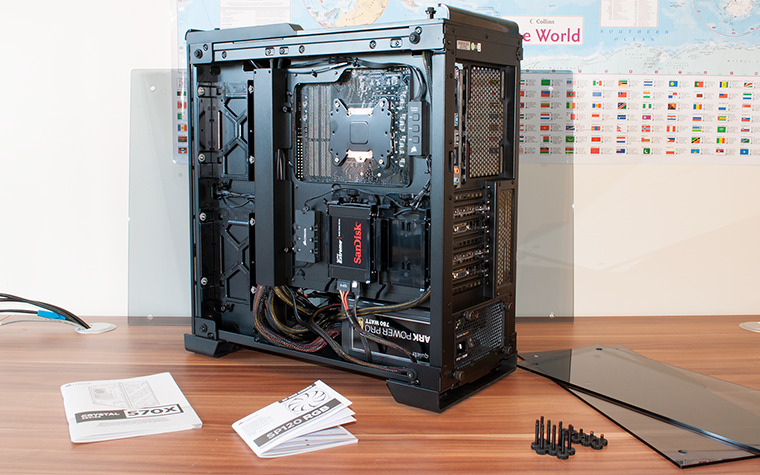 Looking good is one thing, but what's the 570X actually like to work with? 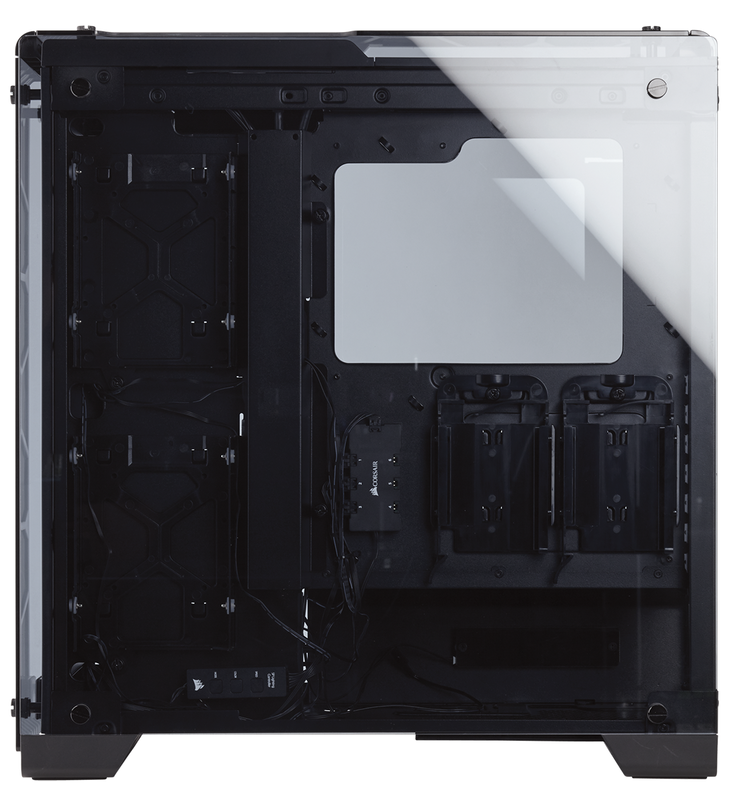 Well, it isn't as quick to disassemble as other Corsair chassis - removing the four glass panels entails 16 screws - but when it's open the top and front magnetic filters are easily pulled away, leaving a roomy interior that is for the most part well laid out. Motherboard sizes are supported up to ATX, there's room for graphics cards measuring up to 370mm in length and the bottom PSU tray is covered by a shroud carrying a backlit (white) Corsair logo. 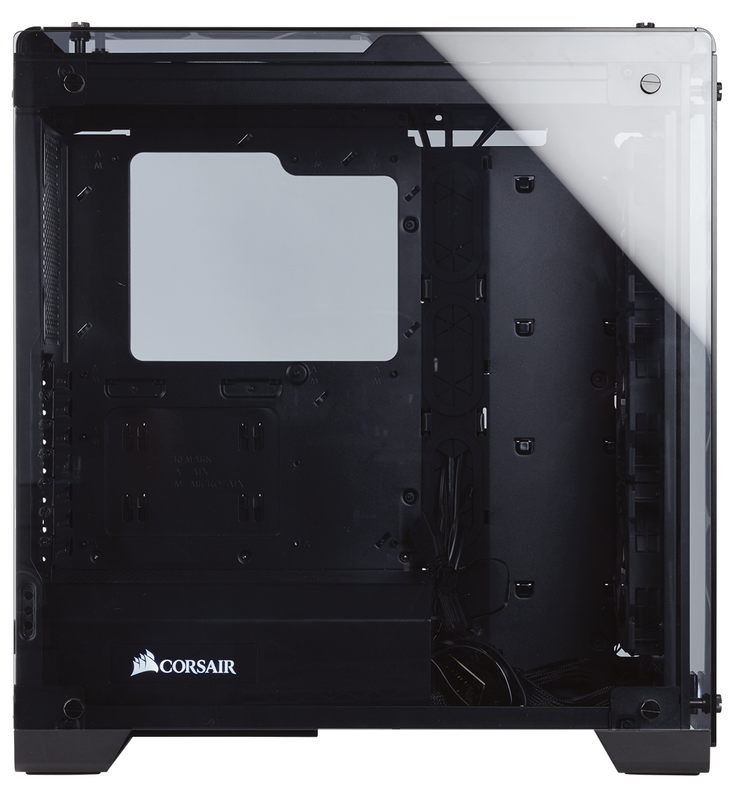 It's a shame the shroud doesn't run the full length of the case in order to completely hide the cables, but Corsair is going by the presumption that 570X users are going to want to install a pump and reservoir. Mounting points for said optional extras are provided to the right of the PSU bay, and there's no shortage of fan-mount locations. The front of the case can accommodate three 120mm or dual 140mm, while the top caters for two 120mm or two 140mm. There's also a 120mm mount on the rear, but what's handy is that the top and front fan mounts are on independent trays that are fixed to the chassis using thumb screws. Undo the screws and the tray can be removed, allowing the user to attach a radiator outside the case before slotting the assembled unit back in place. Style is ultimately the priority, so unsightly 5.25in optical bays have been overlooked, while the four storage bays are tucked behind the motherboard tray. These include two 2.5in and two 3.5in, all of which are plastic in material and removable if not needed. Cabling is going to be a challenge with transparent panels on both sides, and the end result is a mixed bag. In order to hide as much as possible, Corsair has a removable metal column attached to the rear of the cable-routing holes. Fixed on hinges and secured using a pair of thumb screws, it does a good job of keeping cables out of view, but it did take a fair bit of force to get it back on with the amount of cables in our test platform. For a case of this size, we're surprised to find that there are no cable-routing holes beneath the motherboard tray, and there's also extra wiring to contend with on account of the RGB fans. Each fan has two cables - one going to the hub for LED control, the other to the motherboard - and the controller is then routed to the top of the case. The integration isn't seamless, which shouldn't come as a surprise as it is effectively a standalone RGB fan kit added to a tempered glass case. These are compromises to be considered, yet the completed build does look smart, so let's see if performance is up to scratch.